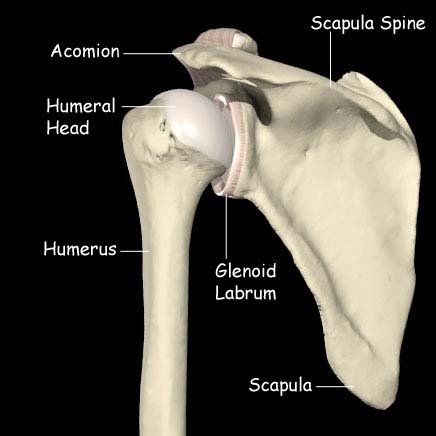 The shoulder joint consists of 2 bones, the Scapula and the Humerus. The scapula has several parts. The blade of the scapula is what can be felt as the shoulder blade. This provides a surface for the attachment of many muscles. The acromion is a continuation of a thickening of the blade called the spine of the scapula. 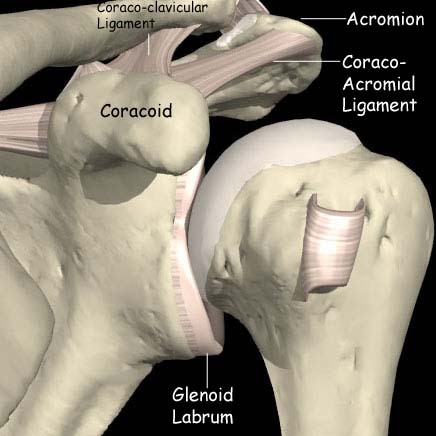 The acromion lies over the top of the shoulder joint, covering the rotator cuff muscles. Part of the deltoid muscle takes its origin from this bone. 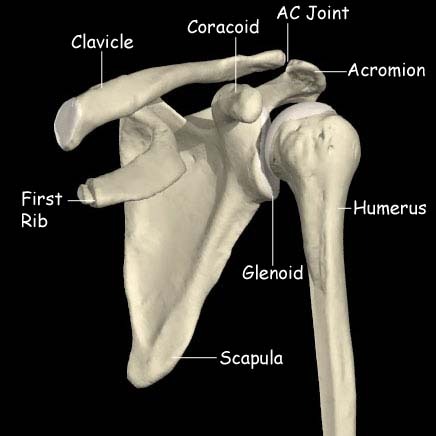 The acromion forms a joint with the clavicle (collar bone) at the front of the shoulder (the acromio-clavicular joint). A small protrusion of the scapula forwards is the coracoid and this has the origin of part of the biceps muscle. The final part of the scapula id the glenoid. This is a flattened area in facing outwards and serves as the articulating or joint surface with the humerus. The humerus has the long shaft of the upper arm and ends with the humeral head, which articulates with the glenoid. There is a groove for the long head of the biceps muscle and tuberosities (bumps) for the attachment of the rotator cuff muscles. The humeral head articulates with the glenoid. Both are covered with articular cartilage that allows low friction movement. One side (the humerus) is convex and the other (the glenoid) is flat. As this is an inherently unstable arrangement a rim of tissue, the labrum, deepens the glenoid. If this rim becomes damaged or detached the shoulder joint can become unstable or dislocate. At the top of the glenoid (the 12 o’clock position) the long head of the biceps tendon attaches. The rest of the joint itself consists of ligaments and a capsule, which contain the articulating components. The shoulder joint is capable of a large range of motion and requires several muscles to do this. The deltoid is the largest muscle of the shoulder and takes its origin from the clavicle, the acromion and the scapula spine. It inserts into the humerus about 8cm down on the outer side. This is a very powerful muscle, which allows the shoulder to forward flex, to lift to the side and to push the elbow backwards. This comprises 4 muscles which stabilize the shoulder joint. From front to back they are the subscapularis, the supraspinatus, the infraspinatus and the teres minor. The subscapularis inserts into the lesser tuberosity at the front of the humerus and the other three insert into the greater tuberosity at the top, outer edge of the humerus just lateral to the articular surface. 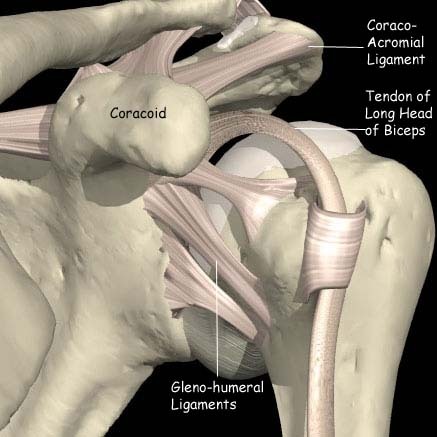 When these muscles contract they act to center the humeral head in the glenoid, facilitating the action of deltoid. If they are weak or torn (rotator cuff rupture) shoulder function is significantly compromised. A bursa is a fluid filled sac which allows two surfaces to glide over each other more easily. Several bursae exist in the shoulder. 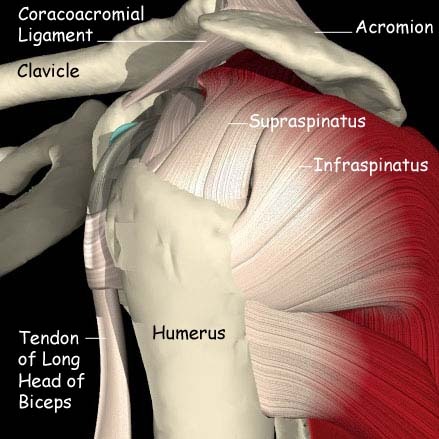 The one most often associated with problems is the one that lies between the undersurface of the acromion and the upper surface of the rotator cuff tendons. 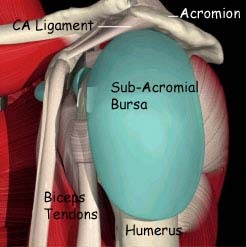 In some conditions the bursa can become inflamed adding to the pain of subacromial impingement.